For efficiency and power, nothing beats RimFire outrunner brushless motors. Their range is impressive, too; choices are available for aircraft as small as 150-size micros and go all the way up to motors for giant gasoline-to-electric conversions. If you think that’s exciting, wait until you see this! 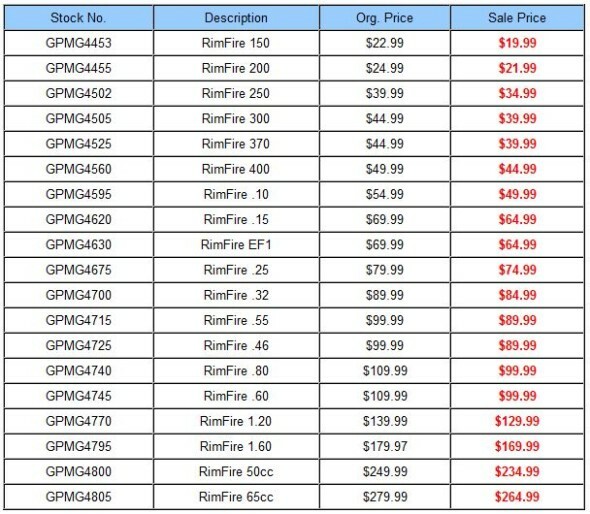 For a limited time, prices on all RimFire motors have been slashed. That’s right. All RimFire motors are priced for maximum value – but only for a limited time. Want to take advantage of this special offer? Buy any RimFire motor from now until April 30, 2014 for today’s best brushless power and spectacular savings! Offer ends April 30, 2014. Click HERE to find your nearest ElectriFly dealer! Next Free Futaba S3004 Servo with Purchase of Select 2.4GHz Radios!